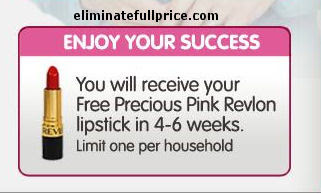 While supplies last, Walgreens is having a special promotion on their website where if you're one of the first 12,000 people to share a goal you'll receive a free Precious Pink Revlon lipstick! When you get to the website in 75 words or less share your goal and then click on continue. Then enter your name and address. Leave a comment and let me know if you were able to successfully be one of the first 12,000 to get a lipstick!